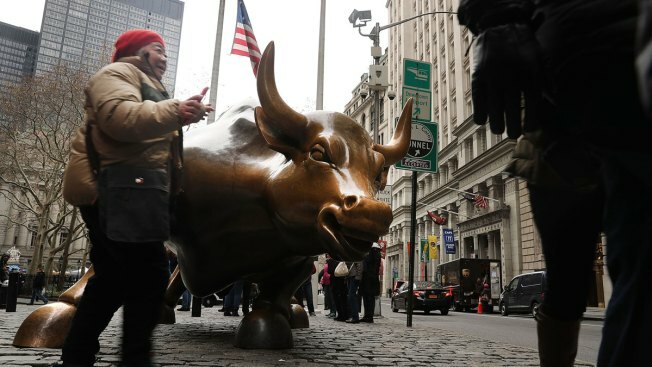 In this Dec. 8, 2016, file photo, tourists take a picture with the market bull near the New York Stock Exchange in New York City. U.S. stocks rose on Wednesday, capping off a strong start to 2018. The Dow Jones industrial average and S&P 500 notched their best monthly performance since March 2016, CNBC reported. The Dow gained 73 points, with Boeing rising 4.9 percent and hitting an all-time high. The S&P 500 rose 0.1 percent, with real estate as the best-performing sector. The Nasdaq composite also advanced 0.1 percent. For the month, the Dow and S&P 500 posted gains of 5.6 percent and 5.8 percent, respectively. The Nasdaq meanwhile, rose 7.3 percent for the month, its best monthly gain since October 2015.